Cover Run celebrates the awesome work of cover artists even the best comic pencillers don't mind stepping aside for. 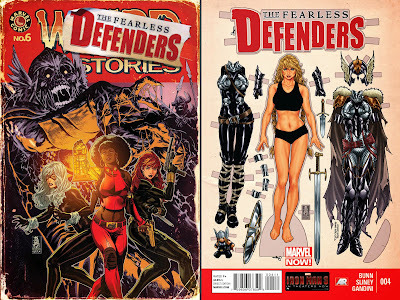 This edition follows today's news that Marvel's The Fearless Defenders series will end with December's #12. For eleven of those issues, artist Mark Brooks delivered detail, creativity and awe in truckloads, making for one of the best cover runs ever. I ask you, whose character sketches are ever good enough that you can make arresting cover art out of them? Mark Brooks' that's whose! Getting rid of Valkyrie's silver cone bra might have been dicey waters to navigate, but Mark sealed the deal showing the thought put into the Asgardian Defender's new look! 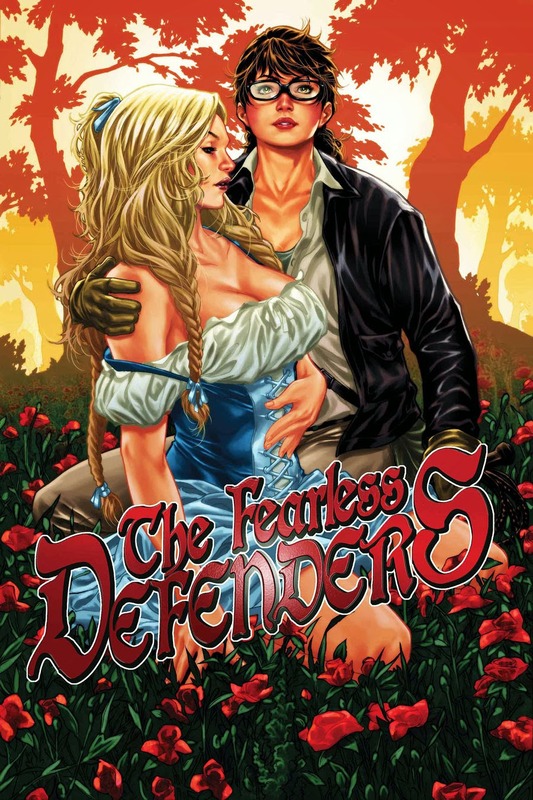 The catch with team books like this, Force Works and others that dare to fly the non-X, non-Avenger flag, is where the characters will end up after the series closes doors. 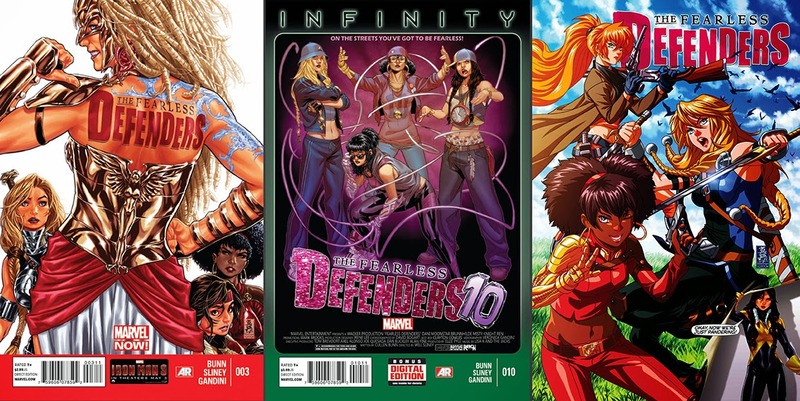 Valkyrie, Misty Knight and Dani Moonstar are great heroines, who deserve more than to go back to just being supporting cast members for Thor, Cage and Cannonball. 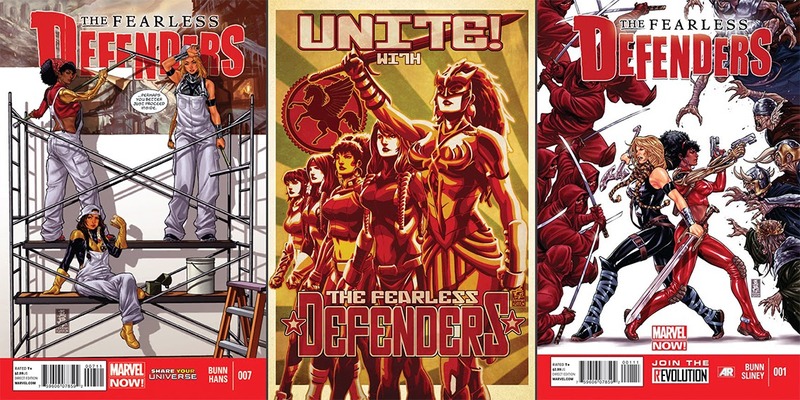 With so much versatility in the range of covers, it's hard to believe they are all from the same pen. What a great portfolio! I still remember that Horror Comics themed cover - it was my mobile phone wallpaper for ages! 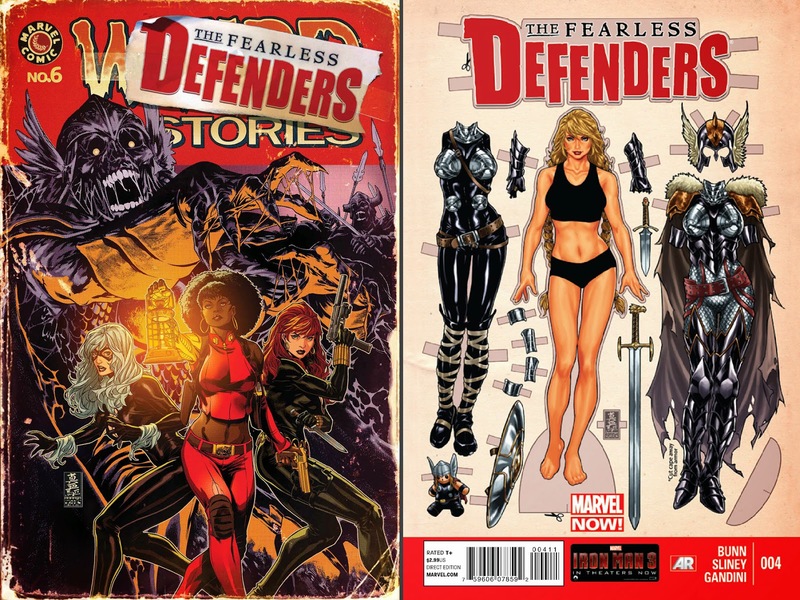 And as a star of the 80's Defenders series, Valk sure suited the retro vibe of the cardboard doll theme. 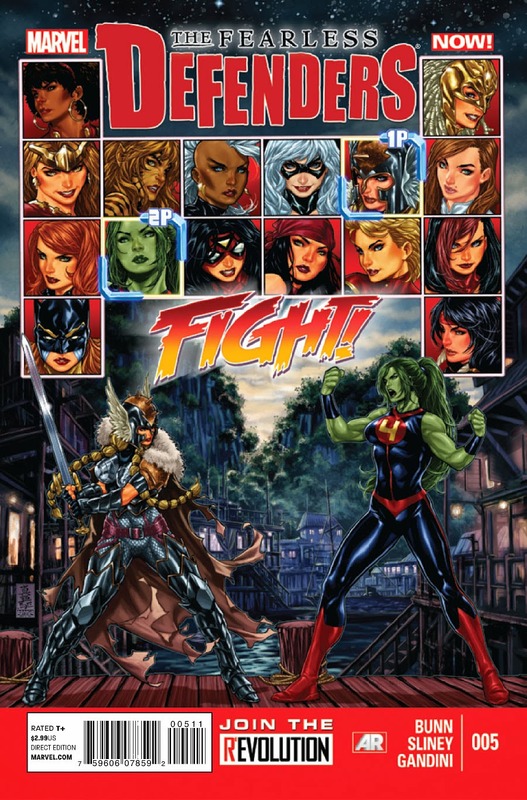 Now that would be a fighting game with serious potential! 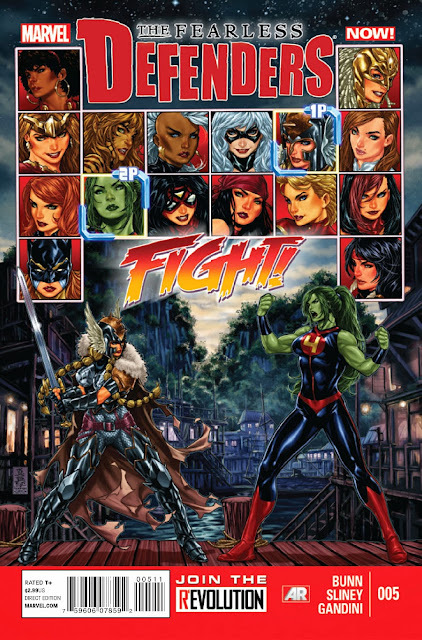 While I'd instantly pick mohawk Storm, an actual game like this could easily make household names out of Tigra, Black Cat and Spider-Woman! Wow! 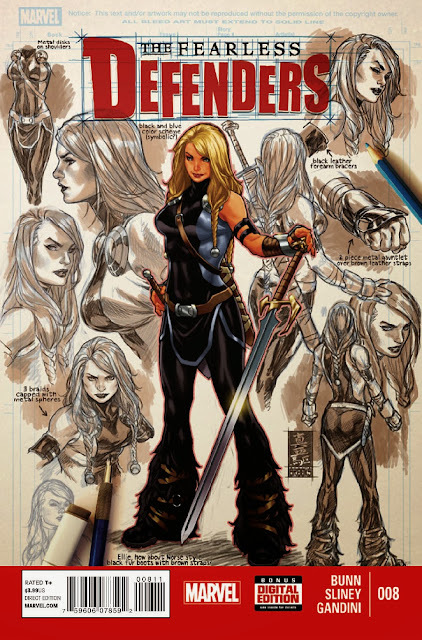 yeah, I've always enjoyed looking at Mark Brooks work since his deviantart days. The covers alone are true works of art that could easily be re-published in an art book or collection of his famous works one day. 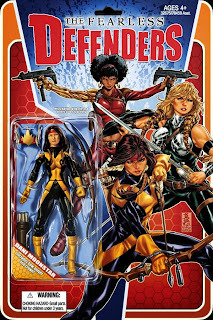 My favorites are indeed the mock Video Game battle screen ala Street Fighter, and of course, the Dani Moonstar Action Figure one. Shame its ending, but Marvels current penchant for ending series after twelve issues only to start over again isn't surprising. FD wasn't a patch on BoP in my opinion...not enough interesting female characters to hold attention for long. Only Misty and Valkryie impressed, but the Hipployta knockoff jarred, after all my reading of the one and only true version in Wonder Woman. Black Widow [Yelena Belova for the spy fans]. Thanks Dale! 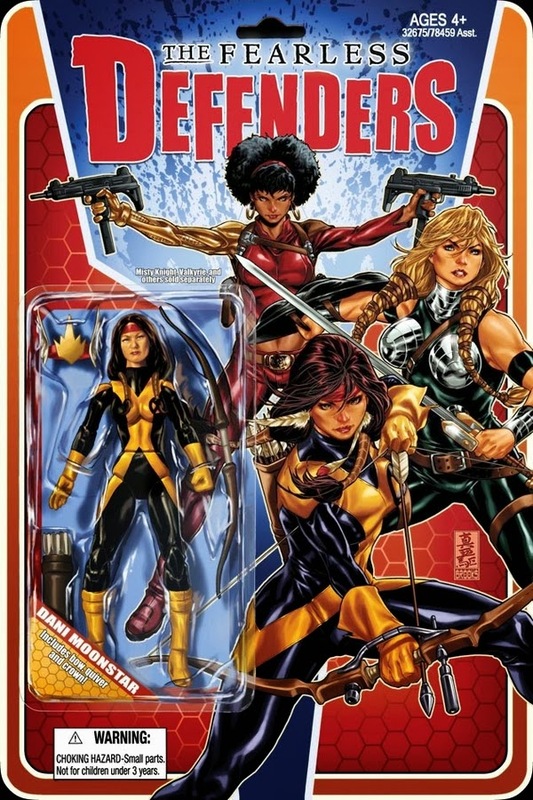 Yeah I think that action figure cover is an all-time hall of famer personally. Karl you bring up a good point, I have to admit as much as I liked the covers I didn't pick up the book because I didn't get the motive for the heroes to get together. Valkyrie needed new maidens, but that didn't sound enough to spin a series out of, so I backed off, and even favourites like Black Cat, didn't have me dropping in. 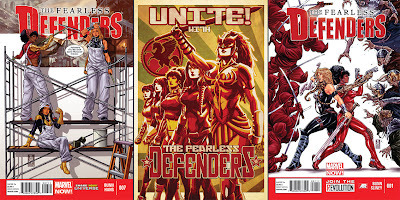 Plus I was never sure of their connection to The Defenders - were they a continuation of the non-team team, or something else. If I don't get he concept, I can't take it to the counter. Quickly off the top of my head, my six would be Misty, Valkyrie, Shanna The She-Devil (with Zabu of course), Crystal, Rogue and Aurora. Plot though, I'm still not sure. I think I'd want to break the BOP connection so I'd keep a mission Impossible theme, but just give the team one overarching goal, with various smaller components. One of the toughest cover runs ever. It sure is. Here's hoping it leads to something with an even higher profile!